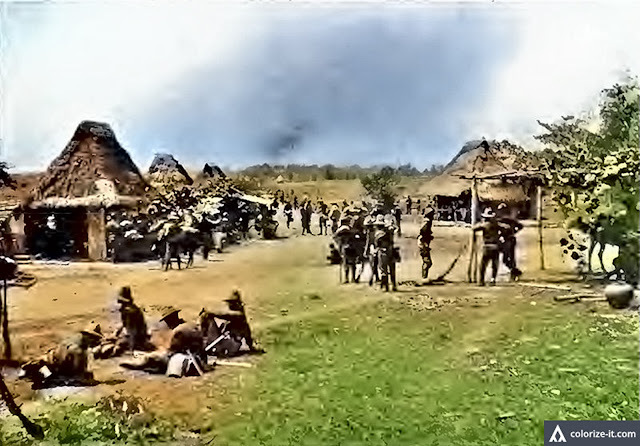 Image extracted from the public domain book "Our Boys in the Philippines." Just over two years after the surrender of General Miguel Malvar to the United States Army, effectively putting an end to the Philippine-American War, the province of Batangas was still far from being in a state of peace and normalcy. Partly, this was because in the second half of 1904, bands of outlaws which the Americans called “ladrones1” (or “tulisanes” as they were known in Tagalog) started becoming more active not just in Batangas but also in the neighboring provinces of Cavite, Laguna and Tayabas (presently Quezon)2. Because of the ease with which these groups of bandits made money, some began to attract more members. Still others saw wisdom in merging with other groups. As a consequence, the larger groups of bandits began to get more brazen and left their isolated lairs to raid the larger towns. Although Batangas had been returned to civilian rule in 1902 as per the directions of the Philippine Commission, the present situation in 1904 warranted the participation of the United States Army. Cavite, Batangas, Rizal and Laguna were declared a provisional or temporary district where the writ of habeas corpus3 was suspended. The temporary district was placed under the command of one Colonel Baker of the Constabulary, who set up headquarters in the town of Lipa. The Americans were aware that by and large, the native population within the provisional district did not really like the presence of or cooperating with the bandits. However, the reader has to understand that this was just two years after the end of the Philippine-American war, during which the civilian population of Batangas, in particular, had to live for half a year effectively in incarceration in concentration camps. The Americans, thus, needed to demonstrate to the local inhabitants of Batangas and the other provinces within the provisional district that their campaign against the ‘ladrones’ was in earnest and would not cease until their leaders had been either captured or killed. With community support obtained, before long American authorities were efficiently able to track the bandits down. 1 From the word “ladron,” meaning thief in Spanish. 2 Most of the information from this article comes from “Annual Report of the Department of Commerce and Police for the Year Ending June 30, 1905,” part of the Annual Report of the Secretary of War 1905, Volume 12.